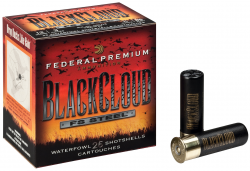 ANOKA, Minnesota – Federal Premium Ammunition was recently awarded two bronze Telly Awards for its Fusion and Black Cloud television commercials, showcasing the products’ dynamic performance. The Telly Award is the premier award honoring the finest film and video productions, groundbreaking web commercials, videos and films, and outstanding local, regional, and cable TV commercials and programs. Their mission has been to strengthen the visual arts community by inspiring, promoting, and supporting creativity. The 36th Annual Telly Awards received more than 13,000 entries from all 50 states and five continents. Federal Premium won the 2016 Bronze Awards for its “Fusion Freight Train” (Fusion) and “So Do The Ducks” (Black Cloud) TV commercials in the Multi-Market Cable - Sporting Goods category.